This season is full of opportunities to get together with friends and family and get creative. Gingerbread houses have always seemed magical. From the icing windows to the candy roofs and the fluffy trees on the lawn, these holiday icons take us back to our childhood. 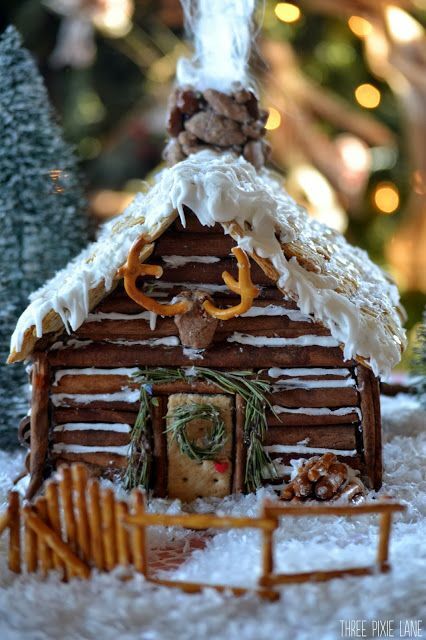 Building a gingerbread house might just be the perfect way to spend a snowy day. 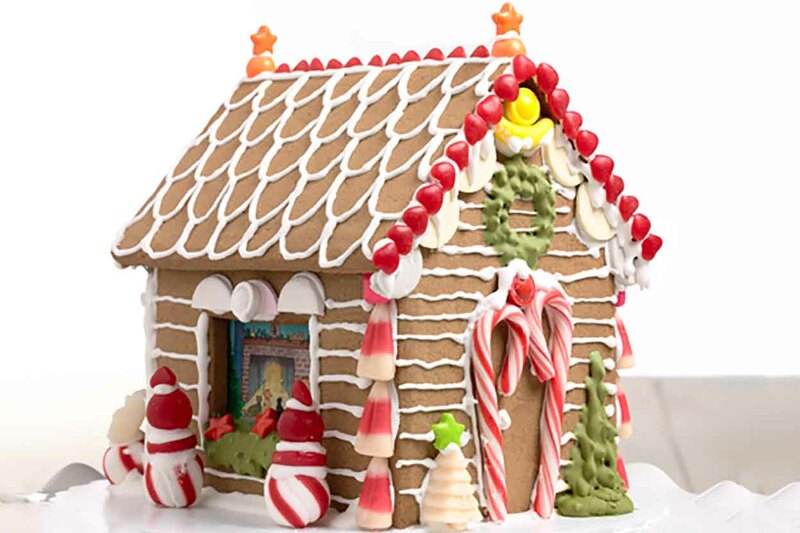 Since we know it is rare to have time during this busy season to make a house from scratch, we are sharing some ideas that inspired us and were can be made from store bought gingerbread kits. Once you put the house together, the possibilities are endless. We love these ideas! When you create something rustic, it allows for imperfections. That is what makes it so charming. This cozy mountain cabin idea comes from Three Pixie Lane . Pretzel rods and icing were used for the walls and mini frosted wheat cereal covers the roof. Cotton candy poofs of smoke roll out of a chimney made from cinnamon and sugar covered almonds. Rosemary sprigs around the door and used as a wreath make it all the more realistic. Tip: It is easier to decorate on a horizontal surface vs. a vertical one. Decorate the sides and ends before you assemble for an easier time of it. I tried this creation and it was easy and fun! Even if you start with a gingerbread house kit, you can still pick the finishes you like. Start with the brown house and pipe on white trim for a simple look. The addition of pine cones and powdered sugar make this little house all the more charming. Build the house you want to eat! Cover the entire house in candy. After all, these houses are supposed to be whimsical and dreamy. Cut out a window in one side of the house and build a scene from the inside. We love these little peppermint snowmen watching the fire through the window from King Arthur Flour. We all know that houses need curb appeal! Changing up the basic gingerbread structure is easy and can totally transform your creation. Turn the house sideways, add an awning and candy cane posts, and it is a totally unique take. If you have the time and are planning to make your house from scratch, here is a basic gingerbread house recipe from Food Network. Click the image to read more. Happy Building! 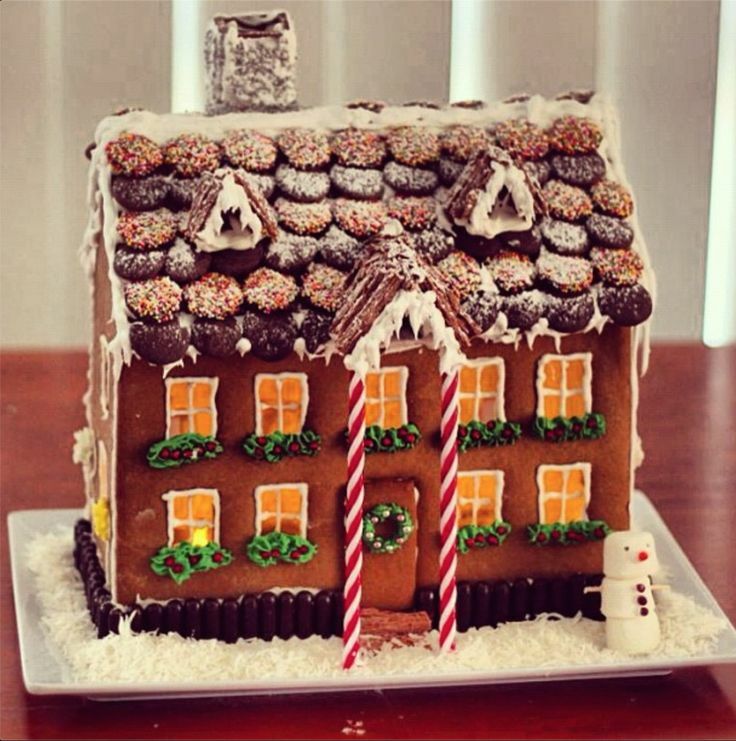 If you make a gingerbread house this year, we would love to see it! Share in the comments below.